St. Patrick’s Day Weekend is in full swing, but we still gotta eat! Make those Irish tummies smile with this ‘everything but the meat’ version of a hearty and yummy Irish stew! I bet no one will even notice you replaced the traditional lamb with earthy-rich portobello mushrooms! Mmmmm! Enjoy! And have a safe and Happy St. Patrick’s Day!! Saute the onions, carrots and potatoes in the olive oil and Earth Balance in a large pot for about 20 minutes on medium. Add the vegetable broth, wine, thyme, garlic, and tomato paste and softly simmer for about an hour or until the vegetables are soft and the house smells amazing. Serve warm with a hearty crusty bread. The perfect dinner to soak up all that green beer! 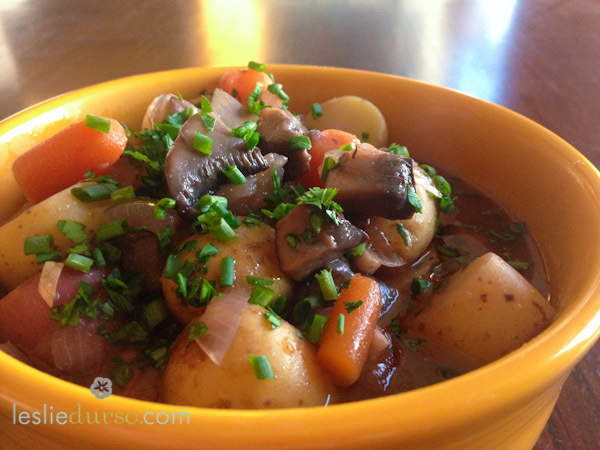 Try my #Vegan Irish Stew – http://t.co/A6bRJiw0MK Happy St. Patty’s Day! Made this yesterday for early Easter dinner. It was delicious. Everyone loved it! I’m so happy to hear that Melissa 🙂 I hope you had a fabulous Easter! This stew is terrific! I upped the veg so added a little more broth/wine/paste. I also threw in some herbs de Provence. What a tasty treat! Glad it turned out well Lauren 🙂 Thanks for sharing!